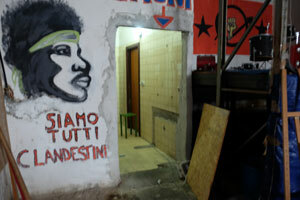 Jean*, an African migrant expoited by employers in Italy, tells his story. In 2006 I was studying English and German in the Ivory Coast and things were getting complicated politically. I was part of a political movement and at a certain point I realised it was better for me to leave if I wanted to have a chance of becoming a language teacher. I’ll never forget my journey to Europe. It was terrible, I was robbed, put in prison and beaten up. We got a lift part of the way through the desert and then we were left. I walked for three days without food and water. At night we buried ourselves in the sand so we’d be cooler in the daytime. We were robbed when we were in the desert and they took everything, even our clothes. Some Libyan soldiers then picked us up and took us to prison. Along with some others, I managed to escape the prison. My country was much better than Libya but I realised there was no way for me to get back home as I had no documents. A Ghanaian man said I’d be better off going to Europe than staying in Libya. He said I’d be able to study there and get a good degree. I’d been working as a builder and I paid US$1200 to some Libyans who said they’d take me to Europe by boat. Soon afterwards, I heard 150 migrants had drowned in the Mediterranean but I couldn’t change my mind about leaving as I’d lose all my money. There were around 70 of us packed on a small boat. We reached Lampedusa and from there we were sent to Rome. Some nuns taught me Italian there and it was good to learn a language again. After a few months the Italian authorities refused my request to stay. I got kicked out of the camp I was staying in and I started to sleep rough. I’d go for meals at the Jesuit Refugee Services centre for migrants. Someone suggested I might get work if I went to Naples, so I went to Caserta and stayed at Caritas and they gave me food and clothes and support. I started to go to one of the many roundabouts where immigrant workers waited in the early morning for employers who would offer them jobs. After four days a woman offered me a job picking tobacco. I’d work from 5.30am to 5.30pm for €25 (US$28). I didn’t have much choice as I had no documents. The employers know that they can do what they want with you when you’ve not got your documents. I went down to Rosarno (southern Italy) to pick oranges for a while and then came back up to Naples where I got a job working for an electrician, as I’d studied a little bit to be an electrician. He was supposed to pay me €5 an hour, but after one month he only gave me €250 instead of €1200. He said if they paid him the full amount Caritas would make me leave where I was staying. I got sacked anyway. They knew I had no papers and was afraid I could go to prison. After that I started working for a woman picking tobacco. She said she’d pay me after two months but instead she didn’t pay me anything. Caritas got me a lawyer to get the money back, but we didn’t manage it. I got my papers when the Italian Government created an amnesty for migrants. I still dream of a future. I’m working as a mediator for migrants here at the Caritas centre and I’m part of the Immigrant and Refugee Movement of Caserta. I feel I can help people change their lives and I want to use my experience with racism to help them. They say that slavery’s been abolished yet it still exists but it’s invisible. It’s inhuman to treat us like this. We need laws against exploitation and we must all work together – all people of all different races – for future generations. The telling of this story was made possible thanks to the support of the US Embassy to the Holy See.